Posted September 15, 2017 by The Rapid & filed under News. A renewal of The Rapid’s operating millage that funds Greater Grand Rapids public transportation system is up for a vote on Tuesday, Nov. 7, 2017. What will the millage renewal accomplish? Our mission is to create, offer, and continuously improve a flexible network of regional public transportation options and mobility solutions. – Citizens can live conveniently without owning a car. – More citizens choose public transportation because it is an easy, economical, and efficient way of getting where they want to go. – Employers choose our community because it provides multiple solutions for getting employees to work. – Public transit serves as an economic engine. – Public transportation is an integral part of the life of every citizen in the region and creates opportunities. – Public transportation supports sustainability and economic development. What’s the purpose of the tax? Along with passenger fares and state operating assistance, the property tax helps fund The Rapid’s operations budget. The Rapid is a public transit organization funded under Public Act 196 of 1986. This is the method provided by the State of Michigan for local transit operators to provide the necessary local funds for public transit. These local millage funds will provide approximately 35.5% of our operating budget. The remainder is made of fares paid by passengers 16.1% and contract revenues for service14.5% and local bus operating assistance (LBOA) at 32.7% from the Michigan Department of Transportation with other revenue sources making up the balance of 1.2%. Property owners in the 6 cities of Grand Rapids, East Grand Rapids, Kentwood, Wyoming, Walker, and Grandville. What communities does The Rapid serve in Kent County? There is no additional cost for a renewal – the tax will be renewed at its current rate of 1.47 mils. For a $100,000 home with a taxable value of $50,000, the homeowner would pay roughly $73.50 per year. How will the millage funds be used? Millage funds are used strictly for expenses directly related to operating service (labor, fuel, etc.). Whom does a millage renewal help? A millage renewal helps everyone, whether you ride the bus or not. The Rapid provides an average of 1 million rides per month, and these are people who are going to doctor’s appointments, to school, to work, to go shopping, or attending community events. A millage renewal ensures that everyone in our region has access to all of these things. Minimum- and low-wage earners, persons with disabilities and senior citizens also rely on The Rapid to go about their daily lives. Some people need public transportation to get to their jobs. Many passengers use The Rapid to receive dialysis, chemotherapy and other medical treatments. Others are unable to drive or can’t afford to own a car and pay for auto insurance. Special-need students depend on the bus to get to school. 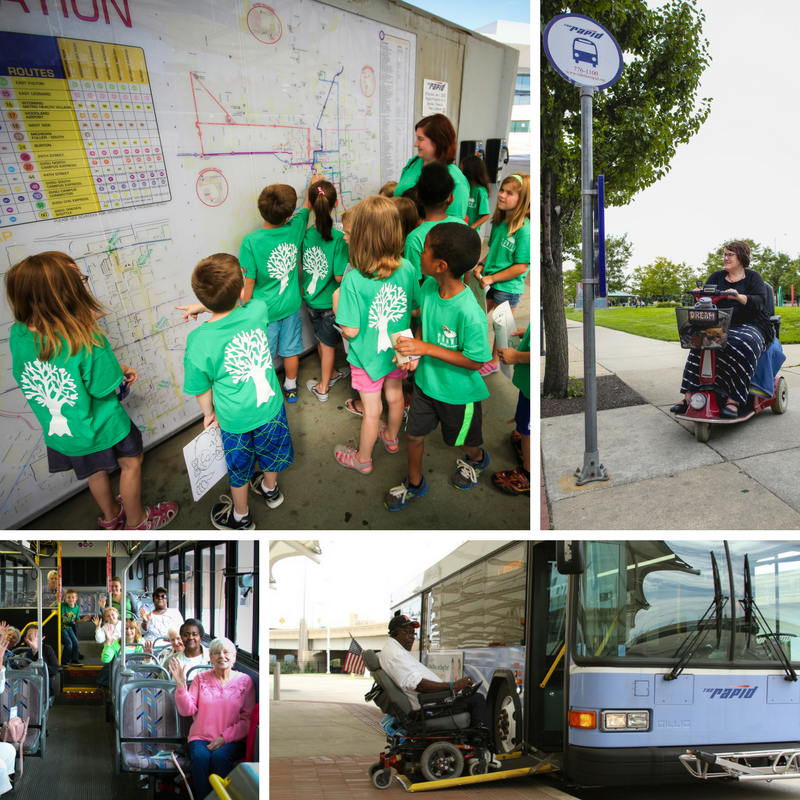 The millage renewal is essential to The Rapid’s efforts to ensure our community’s most vulnerable citizens can maintain their independence and help low-income workers have access to affordable transportation options. How does a millage renewal help support local school systems? Many Grand Rapids Public Schools students ride The Rapid to get back and forth to school. A millage renewal ensures that these students have the transportation they rely on each and every day to get to and from school. How does a millage renewal help the local environment? A millage renewal will allow The Rapid to continue to improve the quality of the air we breathe by reducing automobile dependency, and thereby reduce emissions. The Rapid will be able to continue its conversion to a 100% compressed natural gas fleet of buses, as well as continue operation of its fleet of propane fueled paratransit vehicles. Research shows that public transportation has a positive impact on our environment: it saves the equivalent of 900,000 tanks of gas every day; it produces nearly half as much carbon dioxide as private automobiles per passenger mile traveled; and it reduces carbon monoxide by almost 745,000 tons annually (source: American Public Transportation Association). Who can vote on the proposal? Registered voters who live within the boundaries of the communities identified above in Question #3 can vote on The Rapid millage renewal at their precinct on Election Day Tuesday, Nov. 7, 2017. You can also obtain an absentee ballot from the City or Township Office where you are registered. The deadline to apply to receive an absent voter ballot by mail is 2 p.m. Saturday, Nov. 4, 2017. After this deadline, you may vote an absent voter ballot in person at your local clerk’s office up until 4 p.m. on Monday, Nov. 6, 2017. Please note: No absentee voter ballots will be supplied through a telephone request. They must be requested in writing. An absentee voter ballot application is available at https://www.accesskent.com/Departments/Elections/pdfs/Absentee_Ballot.pdf. If you are still unsure of your polling place, please contact your local City/Township office.